The loudest animal in the world is also the largest animal in the world, in fact the largest animal that has ever existed on this planet (yes, bigger than any dinosaur). It is of course the Blue Whale. 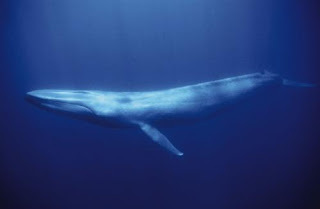 The blue whale can produce sounds up to 188 decibels. This is the loudest sound produced by a living animal and has been detected as far away as 530 miles. A jet engine creates only 140 decibels! Blue whales grow to be about 80 feet (25 m) long on average, weighing about 120 tons (109 tonnes). The largest specimen found was a female 94 feet (29 m) long weighing more 174 tons (158 tonnes). The females are larger than males, as with all baleen whales. The largest of the blue whales (150 tons) has a heart that weighs about 1,000 pounds (450 kg) and has 14,000 pounds (6,400 kg) of blood circulating in its body. The heart is about the size of a Volkswagon bug car. A human could crawl through the aorta (a major blood vessel). Surely being this size they must eat a hell of a lot. Well, Blue whales (like all baleen whales) are seasonal feeders and carnivores that filter feed tiny crustaceans (krill, copepods, etc. ), plankton, and small fish from the water. They are gulpers, filter feeders that alternatively swim then gulp a mouthful of plankton or fish. They can travel up to 30 mph too!!! !